comrade was lost and events which lead up to the Passing. The new DLC will be called “The Sacrifice” it will be available for both Left 4 Dead and Left 4 Dead 2 for PC and XBOX 360, the PC version will be free while the XBOX 360 version will cost Microsoft Points. But to get users hyped up for the DLC and to bring fans back to the game Valve has released a comic book series which is also called “The Sacrifice” with 4 parts. The first part was released today, the second part will come September 21st, the third part will come on September 28th and the 4th part will come on October 4th. The DLC will go live for PC and XBOX 360 on October 5th which is a day after the last part of the comic series. Left 4 Dead 2 is still a great game to enjoy with friends and its a great place to meet new people as well I have encountered many skilled people on steam while playing the game and we often exchange campaign strategies, weapons, tactics etc and the game is still very challenging once cranked up to Expert mode with realism mode turned on. You can view the Comics HERE from your browser and you can use the back and forward direction keys to change the pages, just like those online manga sites. This is a very generous offer from Valve but a paper back copy of the comic would have been a fantastic addition to the merchandising. I would gladly pay $10-$15 for the comic if it were a complete 4 part series. 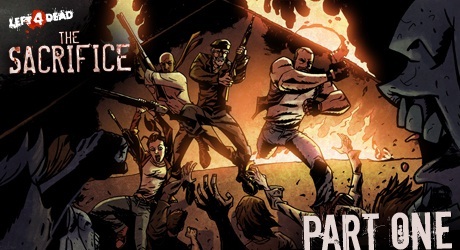 The comic centers around the characters from Left 4 Dead we see the return of all the characters such as Louis, Francis, Zoey and Bill. I just finished the first part and BOY is this thing addictive I just read the first part and boy what an ending.